In the last page, I was talking about how to create an amazing blog in 2019 with step by step guide including the importance of sitemap you need to consider as a professional blogger. A sitemap file is either an XML map or HTML list that includes all the URLs of the pages from your website or blog. A sitemap is an essential thing that helps to get your blog pages indexed instantly by search engines, which gives your blog "visibility" in search results online and can drive more organic traffic to your site. 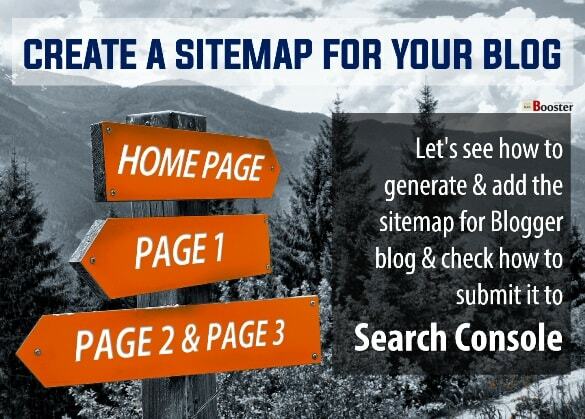 There are lots of other smart ways for building a sitemap for your blogger blog i.e. your Blogspot blog (or self-hosted Blogger blog). However, this blogging tip will teach you the quietest way to generate the sitemap by using and with the help of this technique you may able to create universal sitemaps, which can be indexed quickly not only by Google but also other search engines too. Let's see how to generate & add the sitemap for Blogger blog without sitemap generator & check how to submit it to Search Console and in robots.txt format. In previous posts, you have seen; What is Blog? Blogging? Blogger? How to Start A Successful Blog Furthermore, we have seen, 10 Practicle to Find Your Profitable Niche but today we are going to see how to create, add & submit your blogger sitemap to search console in order to crawl and index every page into search results. Google crawls the web pages regularly and according to the categories for every new blogs or website as soon as it finds & indexes them. In most the cases, it can take some weeks for Google to index a new blog, and may not index all of your web pages at once so this becomes hard for your blog to get indexed and crawled in search results. For better, you can get a Google Email alerts whenever Google indexed your recent blog post. Not just Google broad core search algorithm updates, you must be aware of the Google Search Console changes (earlier known as Google Webmaster Tools), it will help you to get listed your website, pages, contents, and links in Google search results for free if you can assist Google to crawl your blog. Sitemap not only helps to display your site in search results but also the Search Console improves the crawling rate of your website. What is Sitemap? An XML/HTML Sitemap is nothing but a site structure & list of all the accessible page URLs in your website. As a blogger, you must be required adding a sitemap; so as soon as you publish a new post, the search engines can crawl & index them quickly in its database. Although an XML sitemap used to help the search engine to crawl & index pages whereas, the HTML sitemap helps all your visitors to navigate your site pages. Anyways, learn how to create a sitemap for your site. Step 1: First, you visit Search Console and sign up for a free account. BlogSpot accounts are now merged with Google Accounts, so use your Google login for making a Google Search Console Account. Step 2: Once you sign into the Search Console go to "Add new site" segment, enter the full URL of your blog (e.g. : https://www.yourblogname.com). Enter the URL of your site and press OK. Step 3: Now succeeding in adding your blog, you have to get verified. This allows you to access statistics and crawl errors. For that, click on "Manage: URL of your site" on the Search Console's page. In the new page, click on 'Manage Site Verification' in the left side menu. Add a meta tag to your blog template. Upload an HTML file to a directory specified by Google. Step 6: Now save the changes to your template. And click on verify from your Webmaster Tool Account. Your URL will then get verified. Step 7: Now go to sitemaps tab in Search Console Account. Step 8: Now here, click on add a sitemap and then choose general web sitemap from the menu. To do this, click on the "sitemaps" tab at the top of your Webmaster Tools dashboard, and click the "add" link next to your blog URL. Step 9: Now it will ask you for the URL of your sitemap location. Your blog's Atom feed or RSS feed is your sitemap now. Step 10: So paste the link of your atom feed or RSS feed now. For this just put "atom.xml" (or rss.xml) only in a box front of your blog name URL. And you have to put only: "atom.xml?orderby=updated"
The orange box shows that the URL that you have to paste into the sitemap submitting box. Step 12: Now click 'OK' and you are done. Step 14: After few hours, Search Console will review your sitemap and will set your status to pending. After some hours you will find the status set to OK.
Now Google will index your pages as fast as possible than earlier. This ensures that all of your blog pages are properly indexed and available to search. So start publishing new articles and update your old pages to get more visitors and improve organic search results. In a case of increasing the site visitors & for better SEO your blog must have to index first and then crawl by search engines. And Google is the best way for this, because, no doubt its No.1 search engine to drive targetted organic traffic to your website.